"I was born in a place humans call central Africa, in a dense rainforest so beautiful no crayons could ever do it justice." Ivan is a silverback gorilla who lives at the Big Top Mall and Video Arcade. He seems content with his life, drawing pictures and pondering life's big questions with his friends Stella the elephant and Bob the stray dog. When a baby elephant named Ruby suddenly arrives, things begin to change at the Big Top Mall and Ivan must do his best to fulfill his promise to Stella that he will find a way to make a better life for Ruby and for himself. 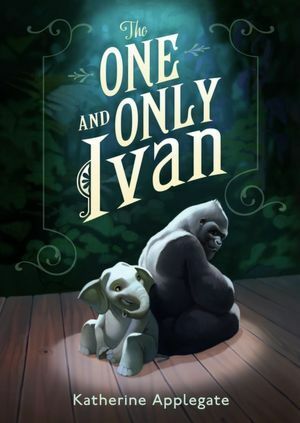 Based on a true story, Katherine Applegate weaves this gorgeous yet simple tale from this gentle silverback gorilla's point-of-view and creates a memorable voice in Ivan. Both heartbreaking and joyous, The One and Only Ivan just begs to be read aloud and discussed. It is one of those books that you read and immediately begin to ponder the best placement of the award sticker on the cover. It is bound to be designated among the canonical works of beloved children's literature such as Charlotte's Web, A Wrinkle in Time, and The Phantom Tollbooth. There are books that take years to become classics, and there are books like The One and Only Ivan that become classics the day they're published. I just got this from the library last week! Glad it's a good one! I think I might follow Steph's lead and pick this up from the library - you've made it sound fabulous! Wow! Amazing book, nice story!! It's my second time reading this book as of this day.